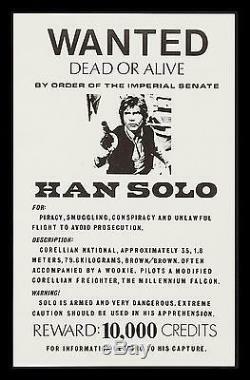 HAN SOLO WANTED POSTER 1970'S. CONDITION: NM-M C9-C10 UNUSED NEVER FOLDED. If it has any minor defects like pin holes, creases, etc. And they are not mentioned above, they should be visible in the high resolution photo. WE DO NOT SELL REPRODUCTIONS OF ANY KIND. Perfect for a high end home theater. Highly sought after by movie poster collectors and aficionados. Get notified of our AUCTIONS & NEW INVENTORY instantly! This is what all you STAR WARS fans have been waiting for! This is a beautiful original vintage 1970'S unlicensed Han Solo Wanted poster. Printed in the late 1970's. "Wanted" poster for the capture or kill of Han Solo. A few indicators that this is not an official. Release are that Wookiee is misspelled, and there is no "Imperial Senate" in the Galactic Empire. From the collection of the late John L. Williams, noted Star Wars collector. A long time can go by without one of these coming up for sale. If a vintage poster is in terrific unrestored condition like this one (EX C8 or better), many experienced collectors will place a premium on it (when compared to a linen backed/restored one). Most experienced collectors prefer unrestored items to restored ones because they believe they will appreciate more in value. This poster is considered to be within that class and is definitely INVESTMENT QUALITY. There are known reprints and/or reproductions of this poster. THIS IS NOT ONE OF THEM! We are absolutely certain it is authentic from the 1970's. Please be advised that over 95% of all Original Movie Posters. Printed before the mid 1980's were issued FOLDED. This is NOT considered a defect. For example, if we say a one sheet poster is 27" x 41" its precise measurements may be closer to 26 3/4" x 40 7/8" (or something similar). This slight variance is quite common for all original movie posters. BEWARE OF "FAKE" MOVIE POSTERS! There are fakes, bootlegs, reprints, and reproductions of almost every popular movie poster. WE DO NOT SELL THESE AS ORIGINALS LIKE OTHERS DO! There are many unscrupulous dealers who successfully pass off these posters as originals. They have been doing it for years! These fakes are almost indistinguishable from originals, only experts can tell. They only discover years later when they sell them that they are worthless. Most are from popular movies from the 70's and 80s, but there are also really old ones and relatively new ones as well. They usually appear in insert size 14" x 36" and one sheet size 27" x 41". The item "STAR WARS CineMasterpieces ORIGINAL VINTAGE HAN SOLO WANTED POSTER 1970'S" is in sale since Monday, January 11, 2016. This item is in the category "Entertainment Memorabilia\Movie Memorabilia\Posters\Originals-United States\1970-79". The seller is "cinemasterpieces" and is located in Scottsdale, Arizona. This item can be shipped worldwide.